There are many examples of a single receptor coupling directly to more than one cellular signal transduction pathway. Although traditional receptor theory allows for activation of multiple cellular effectors by agonists, it predicts that the relative degree of activation of each effector pathway by an agonist (relative efficacy) must be the same. In the current experiments, we demonstrate that agonists at the human serotonin2A (5-HT2A) and 5-HT2Creceptors activate differentially two signal transduction pathways independently coupled to the receptors [phospholipase C (PLC)-mediated inositol phosphate (IP) accumulation and phospholipase A2(PLA2)-mediated arachidonic acid (AA) release]. The relative efficacies of agonists differed depending on which signal transduction pathway was measured. Moreover, relative to 5-HT, some 5-HT2C agonists (e.g., 3-trifluoromethylphenyl-piperazine) preferentially activated the PLC-IP pathway, whereas others (e.g., lysergic acid diethylamide) favored the PLA2-AA pathway. In contrast, when two dependent responses were measured (IP accumulation and calcium mobilization), agonist relative efficacies were not different. These data strongly support the hypothesis termed “agonist-directed trafficking of receptor stimulus” recently proposed by Kenakin [Trends Pharmacol Sci 16:232–238 (1995)]. Concentration-response curves to 5-HT2C agonists were fit well by a three-state model of receptor activation, suggesting that two active receptor states may be sufficient to explain pathway-dependent agonist efficacy. Rational drug design that optimizes preferential effector activity within a group of receptor-selective drugs holds the promise of increased selectivity in clinically useful agents. Historically, the receptor concept in pharmacology evolved from observations made by Ehrlich and Langley of the extraordinary selectivity of drug action. The recent explosion in the number and subtypes of receptors identified has furnished enormous opportunities for the development of highly subtype-selective drugs that maintain therapeutic efficacy while minimizing unwanted effects. The recently proposed phenomenon termed “agonist-directed trafficking of receptor stimulus” (Kenakin, 1995) suggests, however, that relative affinities for different receptor subtypes may not be the ultimate determinant of drug selectivity but that agonists may have the capacity to selectively activate a subset of the multiple signal transduction pathways that may be coupled to a single receptor subtype. There are many examples of a single receptor coupling directly to more than one cellular signal transduction pathway (Guderman et al., 1996). For example, the 5-HT1A receptor inhibits adenylyl cyclase activity (De Vivo and Maayani, 1986) and independently opens K+ channels (Andrade et al., 1986). The TSH receptor stimulates both adenylyl cyclase activity and phospholipase C (van Sande et al., 1990), and members of the 5-HT2 receptor family couple to both PLC and PLA2 (Berg et al., 1994b,1996). In some cases, multiple effectors may be activated by the α and βγ subunits from a single G protein, as has been suggested for some receptors that inhibit adenylyl cyclase (mediated by αi) and stimulate PLC (mediated by βγ) (see Guderman et al., 1996). In other cases, receptors may couple to more than one G protein as, for example, the TSH receptor, which couples to Gs and Gq/11 (Allgeieret al., 1994). Traditional receptor theory assumes that the degree of effector activity produced by an agonist is a function of the receptor stimulus produced by the agonist (Kenakin, 1997), that for a particular receptor the stimulus is independent of the effector pathway to which the receptor is linked, and that the stimulus differs only quantitatively and not qualitatively for different agonists. Although the function coupling stimulus to response depends on the components of the signaling pathways (e.g., amount and type of G proteins expressed, and so on), traditional receptor theory requires that it be independent of the agonist used to produce the receptor stimulus. Thus, the ability to produce a stimulus on receptor binding, the intrinsic efficacy of a drug for a given receptor (ε), as originally defined by Furchgott (1966), is a unique property of the drug, independent of the effector pathway through which drug activity is measured. Agonist relative efficacy [ratio of ε of a test agonist to that of a reference agonist (εA/εAref)] must therefore also be effector pathway independent, and it has been used as a pharmacological tool for identifying and classifying receptors. Recently, there have been several reports of differential effector activation by agonists that are difficult to explain with traditional receptor theory (see Kenakin, 1995, 1996, and references therein). For example, Spengler et al. (1993) found a reversal of the potency of two agonists to elicit cAMP accumulation and PLC-mediated IP accumulation by activating the PACAP receptor transfected transiently into LLC PK1 cells. PACAP1–27 had a slightly greater potency than PACAP1–38 for cAMP accumulation, whereas PACAP1–38 was considerably more potent for IP accumulation than PACAP1–27. Because the affinity of each of these agonists for the PACAP receptor is the same regardless of the response measured, the differences in potency must be the result of differences in the efficacy of the agonists to elicit each response. Robb et al. (1994) reported differences in the potency for octopamine and tyramine to inhibit cAMP accumulation and to increase [Ca2+]i by activating theDrosophila melanogaster octopamine-tyramine receptor expressed stably in CHO cells. Tyramine was almost 2 orders of magnitude more potent than octopamine in inhibiting cAMP accumulation, whereas octopamine was more potent than tyramine when the kinetics (but not the magnitude) of changes in [Ca2+]i were measured. To help explain these experimental observations, Kenakin proposed a new concept of agonist action, termed “agonist-directed trafficking of receptor stimulus,” in which agonists can preferentially induce/select receptor conformational states that favor activation of one effector pathway over another (Kenakin, 1995). Computational simulations of ligand interactions with the 5-HT2A receptor (Zhang and Weinstein, 1993) and recent experimental evidence with the β2-adrenergic receptor (Gether et al., 1995; Krumins and Barber, 1997) support the concept of agonist-selective receptor states, although there is some debate as to the number of receptor conformational states (Leff et al., 1997). For a receptor that couples to multiple signal transduction pathways within a cell, one consequence of agonist-selective receptor states can be differential activation of effectors (Fig.1A). Thus, in contrast to traditional receptor theory, agonist-directed trafficking hypothesis predicts that the efficiency of receptor coupling to each of multiple effector pathways in a cell is a function of the agonist, and consequently agonist relative efficacy could be effector pathway dependent (Fig.1B). A, Illustration of the agonist-directed trafficking hypothesis. When agonist 1 (A1) interacts with the receptor (R), an agonist-selective receptor conformational state occurs that more effectively activates effector pathway 1 (E1) than E2. When agonist 2 (A2) interacts with the same receptor on the same cell, a receptor conformation defined by A2 results that promotes equal activation of both effector pathways. Finally, when A3interacts with R, E2 is favored over E1. B, Simulated concentration-response curves to three agonists measuring two effector processes coupled to the same receptor. For effect 1, agonist 1 has greater efficacy than agonist 2, whereas for effect 2, A3 has greater efficacy than A1. Thus, the overall effect of A1 on cell function could be different from that of A3 due to the markedly different pattern of biochemical effects elicited by the two agonists. Current models of receptor activation are based on a two-state model in which receptors are proposed to exist in equilibrium between inactive (R) and active (R*) conformations (Costa et al., 1992;Samama et al., 1993; Leff, 1995). The active form of the receptor is capable of interacting with effector in the absence of agonist and thus is partly responsible for basal effector activation. Agonists act by preferentially binding to and enriching the active (R*) form, thereby increasing effector activity, whereas inverse agonists bind preferentially to the inactive (R) form, leading to a reduction in “basal” effector activity. Neutral antagonists bind equally well to both R and R* and thus do not alter the equilibrium between the two forms (and do not alter effector activity). In the two-state model, R* can activate multiple effector pathways, but the model does not allow for R* to activate effectors differentially in an agonist-dependent manner. Leff et al. (1997) recently extended the two-state model to a three-state model in which two active receptor conformations (R* and R**) are proposed, each coupling to only one effector pathway. This model allows for differential agonist efficacy at a single receptor subtype in an effector pathway-dependent manner. Although there is some experimental support for agonist-directed trafficking (Spengler et al., 1993; Robb et al., 1994), the hypothesis has not been subjected to rigorous testing. Because acceptance of the concept that agonists can differentially activate effector pathways coupled to the same receptor will have a considerable impact in many areas of pharmacology, physiology, and therapeutics (see Results and Discussion), it is vital that rigorous testing be done. 5-HT2A and 5-HT2C receptors couple to PLC-IP and PLA2-AA pathways in brain tissue (Felder et al., 1990; Kaufman et al., 1995) and in heterologous expression systems (Berg et al., 1994b, 1996). To test the agonist-directed trafficking hypothesis under carefully controlled experimental conditions, we measured the relative efficacies of a series of 5-HT2A/2C receptor agonists on each of the two effector pathways coupled to human 5-HT2A and 5-HT2C receptors expressed stably in CHO cells. We also examined the capacity of the three-state model to accommodate the experimental data. myo-[3H]inositol and [14C]arachidonic acid were purchased from DuPont-New England Nuclear (Boston, MA). 5-HT HCl, DOI, LSD, bufotenin, quipazine maleate, and TFMPP were purchased from Research Biochemicals (Natick, MA). Fetal bovine serum was from Gemini Bioproducts (Calabasas, CA). All other tissue culture reagents were purchased from GIBCO (Grand Island, NY). BAPTA-AM was from Calbiochem (San Diego, CA). Fura-2/AM was from Molecular Probes (Eugene, OR). UT-3122 and ET-O-CH3 were from BIOMOL (Plymouth Meeting, PA). All other drugs and chemicals (reagent grade) were purchased from Sigma Chemical (St. Louis, MO). CHO-1C19 and CHO-FA4 cells are CHO-K1-derived cell lines that stably express human 5-HT2C and 5-HT2A receptors, respectively, at a density of ≈200 fmol/mg protein, have similar maximal responses for IP accumulation and AA release in response to 5-HT, and have been used by us previously (Berg et al., 1994b, 1996). Cells were maintained in minimum essential medium, α formulation, supplemented with 5% FBS and 300 μg/ml hygromycin. For all experiments, cells were seeded into 12- or 24-well tissue culture vessels at a density of 4 × 104 cells/cm2. After a 24-hr plating period, cells were washed with HBSS and placed into Dulbecco’s modified Eagle’s/Ham’s F-12 media (1:1) with 5 μg/ml insulin, 5 μg/ml transferrin, 30 nm selenium, 20 nm progesterone, and 100 μm putrescine (serum-free media). Cells were grown in serum-free media 24 hr before experimentation. Measurements of PLC-mediated IP accumulation and PLA2 AA release were made as described previously (Berget al., 1994b, 1996) from the same multiwell, simultaneously, after 10 min of agonist exposure. Cells in serum-free medium were labeled with 1 μCi/mlmyo-[3H]inositol (10–25 Ci/mmol) for 24 hr and with 0.1 μCi/ml [14C]arachidonic acid (57 mCi/mmol) for 4 hr at 37°. After the labeling period, cells were washed three times with HBSS containing calcium and magnesium supplemented with 20 mm HEPES and 0.1% fatty acid free BSA (i.e., experimental medium). Between washes, the cells were incubated for 5 min in a 37° water bath (15 min total preincubation time). Enzyme inhibitors were present during the 15-min preincubation as indicated. After the wash procedure, cells were incubated in 0.5 ml of experimental medium containing 20 mm LiCl and vehicle (H2O or 0.01% dimethylsulfoxide, as necessary) or drug. After a 10-min incubation, aliquots (100 μl) of cell media were added directly to scintillation vials for measurement of [14C] content with liquid scintillation counting. The remaining medium was aspirated quickly, and 1 ml of 10 mm formic acid (4°) was added to extract the accumulated IP. The [3H]IP (the mono-, di-, and trisphosphates of inositol, collectively referred to as IP) in the supernatant were separated with ion exchange chromatography and quantified with liquid scintillation counting with quench correction. Changes in [Ca2+]iwere measured as described previously (Berg et al., 1994a). Cells in suspension were loaded with Fura-2 by incubating the cells in HBSS containing 0.1% BSA and 5 μm Fura-2/AM at 37° for 30 min in the dark. Cells were washed once, resuspended in HBSS/BSA, and placed (2 × 106 cells) in a stirred, temperature-controlled (37°) cuvette in a fluorescence spectrometer (Photon Technologies International, Monmouth Junction, NJ) equipped with automatic data collection/analysis software. After a 5-min preincubation period, data were collected using dual-wavelength excitation at 340 and 380 nm and an emission wavelength of 510 nm at a frequency of 1 Hz. Drugs were added to the cuvette after collection of base-line values for ≥60 sec. [Ca2+]i was calculated from the fluorescence ratios (F340/F380) after calibration with 15 μm digitonin (to obtain Fmaxvalues), followed by 10 mm EGTA, pH > 9 (to obtain Fmin values). Basal [Ca2+]i was calculated as the average value obtained during 30 sec before drug addition. Maximal changes in [Ca2+]i were calculated as the peak level of [Ca2+]i reached after agonist administration minus the basal value. Concentration-response data were fit with nonlinear regression to the modelE=Emax1+EC50An, where E is the measured response at a given agonist concentration (A), E max is the maximal response, EC50 is the concentration of agonist producing half-maximal response, and n is the slope index. Data analysis using the three-state model of agonist action. The model (Leff et al., 1997) is formulated as:A+R*KA*⇋ AR*active (effector pathway 1)L⥯⥯A+R KA⇋ AR resting M⥯⥯A+R**KA**⇋ AR**active (effector pathway 2) The receptor is hypothesized to exist in three states: an inactive or resting conformation, R; an active conformation, R* (which interacts with G protein G1); and another active conformation, R** (which interacts with G protein G2). In the absence of agonist (A) the distribution of the receptors into the three states is governed by the equilibrium constants (L and M):L=[R][R*] M=[R][R**] The activity of an agonist is governed by the equilibrium dissociation constants KA ,KA *, andKA **, which determine its affinity for R, R*, and R**, respectively:KA=[A]·[R][AR] KA*=[A]·[R*][AR*] KA**=[A]·[R**][AR**] The receptor is distributed among the three unoccupied and three occupied states, so the total receptor concentration isRtot=[R]+[R*]+[R**]+[AR]+[AR*]+[AR**] Using these equations it is possible to derive the relationships between the fraction of receptors in each active state and agonist concentration:fR*=1L+1L·KA*·[A]1+1L+1M+1KA+1L·KA*+1M·KA**·[A] fR**=1M+1M·KA**·[A]1+1L+1M+1KA+1L·KA*+1M·KA**·[A] fR * is assumed to represent the response through effector pathway 1 (in this case, AA release), and fR ** is assumed to represent response through effector pathway 2 (in this case, IP formation). The data were simulated on a Digital Venturis 5100 personal computer using Excel 7.0. The values of L and Mwere set to 100, thus allowing little constitutive activation as observed experimentally. Values ofKA ,KA *, andKA **, were chosen that resulted in simulations most closely matching the experimental data. The Student’s t test was used for statistical comparisons. A value of p < 0.05 was considered significant. To test the capacity of agonists to differentially activate multiple signal transduction pathways coupled to the same receptor, we measured the relative efficacies of a series of 5-HT2A/2C receptor agonists to elicit [3H]IP accumulation and [14C]AA release coupled to 5-HT2A and 5-HT2C receptors stably expressed in CHO cells (CHO-FA4 and CHO-1C19 cells, respectively). We chose to do these studies in heterologous expression systems because they provide the best way to ensure that agonist action evoking the measured response occurs only at the receptor under study. The absence of response due to agonist action at other receptors was verified by testing agonists in the parent cell line, which lacks the target receptor. None of the agonists used in this study produced IP accumulation or AA release in parent CHO-K1 cells. We chose to use CHO-FA4 and CHO-1C19 cells because they expressed a relatively low level of 5-HT2A and 5-HT2Creceptors, respectively (≈200 fmol/mg protein), and there was an absence of receptor reserve for the agonist 5-HT in both cell lines, which permitted the use of the simpler measure of agonist intrinsic activity (the ratio of the maximal response of the test drug to that of 5-HT), as opposed toKA /EC50 ratios, as a measure of relative efficacy. Fig. 2illustrates the absence of receptor reserve for 5-HT in CHO-1C19 (5-HT2C) cells. Irreversible receptor inactivation with PBZ reduced both the maximal IP accumulation and AA release in response to 5-HT by ≈50% each but did not shift the EC50 value for 5-HT for either pathway. This lack of change in agonist potency indicates the absence of receptor reserve for 5-HT in these cells. Note that the potency of 5-HT was the same to elicit AA release and IP accumulation under control conditions, as expected for a drug acting at a single receptor subtype in the absence of receptor reserve. The treatment of CHO-FA4 (5-HT2A) cells with PBZ to produce 50% reductions in maximal responses also did not produce a shift in EC50 for 5-HT for either pathway (pEC50 for AA release = 6.31 ± 0.13 versus 6.44 ± 0.15 and for IP accumulation = 6.49 ± 0.08 versus 6.37 ± 0.10, vehicle versus PBZ, respectively, four experiments). The absence of receptor reserve for both 5-HT2A/2C receptor-mediated responses (IP and AA) also suggests that the 5-HT2A/2C receptors expressed in the CHO cell lines used here are not overexpressed, a situation that can result in aberrant effector coupling. 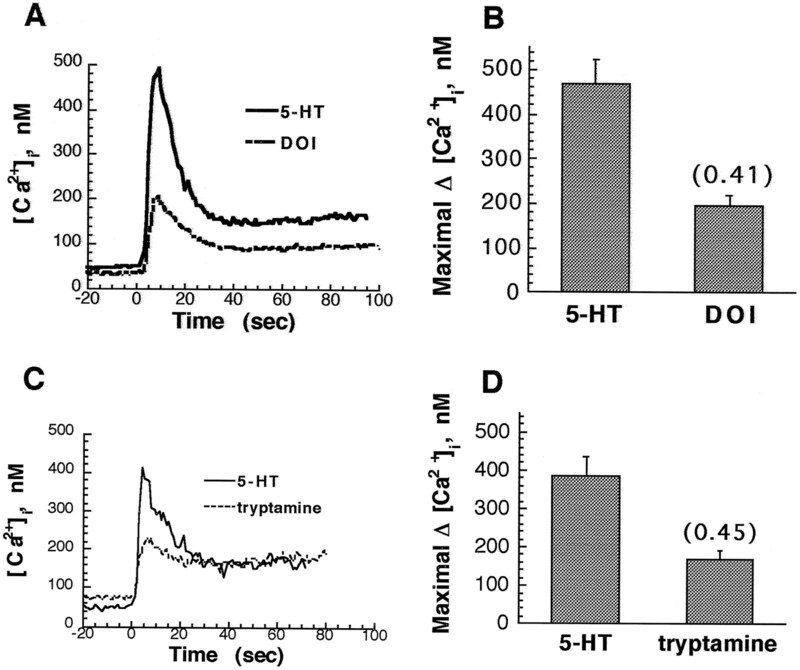 Determination of receptor reserve for 5-HT-mediated AA release (A) and IP accumulation (B). 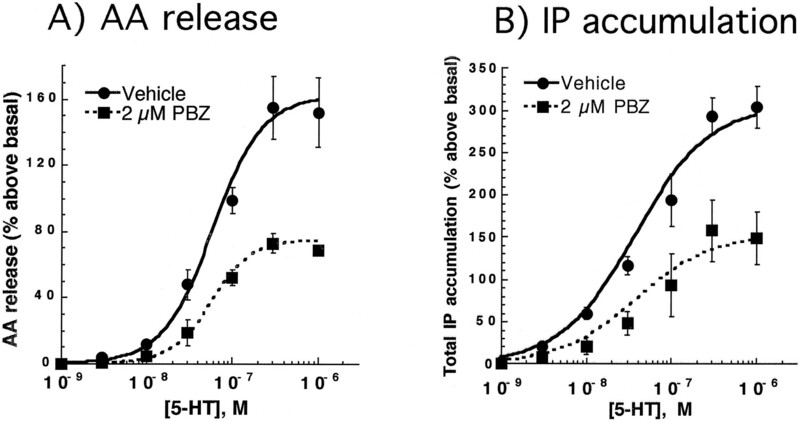 CHO-1C19 cells were treated for 30 min with 2 μm PBZ or dimethylsulfoxide vehicle before measurement of the release of [14C]AA or the accumulation of [3H]IP in response to various concentrations of 5-HT for 10 min. Data are expressed as the percent increase in basal AA release or basal IP accumulation and represent the mean ± standard error of three experiments measured in triplicate. The mean parameters of individual curve fits are provided in Table 1. To avoid potential confounding results that could occur when responses are measured under different conditions or in different cell populations, we developed a method to measure simultaneously agonist-induced IP accumulation and AA release from the same population of cells. Incubation with 5-HT2C agonists, bufotenin, DOI, LSD, TFMPP, and quipazine increased IP accumulation, as well as AA release, in a linear fashion for up to 15 min of agonist treatment. The 10-min time point was chosen for subsequent experiments because a strong, measurable signal (>100%) was obtained for both pathways. For agonists to differentially alter signaling pathways coupled to a receptor, the pathways must not be sequentially linked. If, for example, AA release were a consequence of activation of the PLC-IP pathway, then AA release could not be regulated differently from IP accumulation by agonists (i.e., relative efficacy of agonists would be the same for both responses). There have been reports that activation of PLA2 may occur as a consequence of PLC activation, and vice versa in some systems (Rhee and Choi, 1992; Exton, 1994). Several lines of evidence suggest that the two responses to activation of 5-HT2A and 5-HT2C receptors in our CHO cells seem not to be sequentially linked but rather to be largely independent of each other. First, we examined whether inhibitors of PLA2would alter the accumulation of IP by 5-HT2A/2Creceptor activation, and vice versa. We previously reported that the increase in IP accumulation on activation of 5-HT2C receptors in CHO-1C19 cells with DOI)is unaffected by the PLA2 inhibitor mepacrine (Berget al., 1996). We repeated that experiment under current assay conditions and, in addition, studied the effects of PLC inhibitors on AA release. 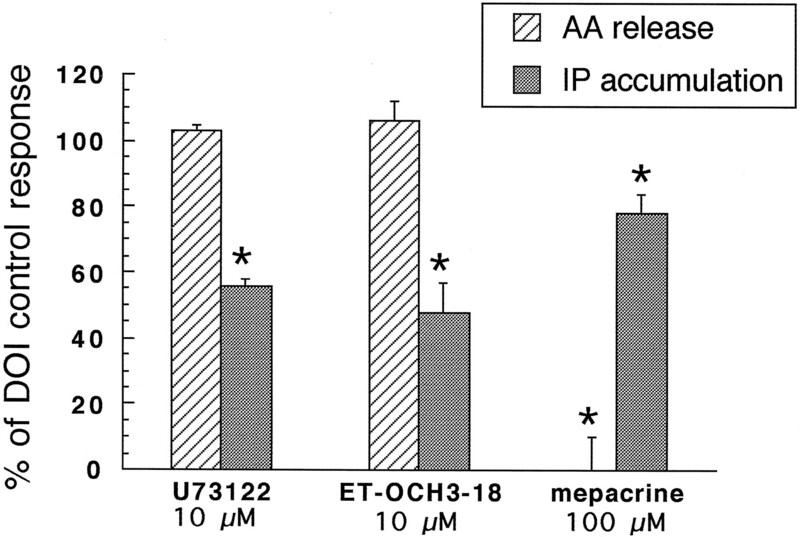 As shown in Fig.3, DOI-mediated AA release was completely abolished in CHO-1C19 cells after 15-min pretreatment with mepacrine (100 μm); in contrast, DOI-mediated IP accumulation, measured simultaneously from the same cells, was only slightly reduced. In a complementary experiment, DOI-mediated release of AA and IP accumulation were measured in the presence and absence of two PLC inhibitors, U73122 (10 μm) and 1-O-octadecyl-2-O-methyl-sn-glycero-3-phosphorylcholine (ET-18-OCH3; 10 μm). After 15-min pretreatment, DOI-mediated IP accumulation was reduced by 50%, but DOI-mediated AA release was unaltered. In CHO-FA4 cells, treatment with mepacrine (100 μm) reduced 5-HT (10 μm)-mediated AA release by 74% without altering 5-HT-mediated IP accumulation (percent above basal, 186 ± 20 versus 162 ± 25; three experiments). Interestingly, although the PLC inhibitors U73122 and ET-18-OCH3 did not block 5-HT2A-mediated AA release, they also did not block IP accumulation. We tested several lots of these inhibitors but were unable to block IP accumulation in CHO-FA4 cells. The effect of phospholipase inhibitors on 5-HT2C receptor-mediated activation of PLA2 and PLC. After a 15-min pretreatment with inhibitors or vehicle, the release of [14C]AA or the accumulation of [3H]IP was determined in response to the 5-HT2C receptor agonist DOI (1 μm). Data are expressed as the percent of DOI control (vehicle) response and represent the mean ± standard error of four to six experiments measured in triplicate. In these experiments, basal AA release was 1449 ± 229 cpm and 4304 ± 558 cpm in the presence of DOI. Basal IP accumulation was 1207 ± 423 dpm and 2864 ± 810 dpm in the presence of DOI. ∗, Significance from control response (p < 0.05). Second, we examined whether IP accumulation would be altered by exogenous application of AA to the cells, as would be expected if IP accumulation were secondary to AA release. Pretreatment of cells (5 min) with AA (10 μm) did not alter either basal or 5-HT2A/2C-stimulated IP accumulation (EC50, E max, or slope factor values) in CHO-FA4 or CHO-1C19 cells. Finally, we examined whether receptor-mediated AA release could be altered by interference with signaling through the PLC-IP pathway. Chelation of intracellular calcium (with BAPTA-AM, 30 μm; 30 min) or inhibition of PKC (with staurosporine, 1 μm; 5 min), or both, did not alter 5-HT2A-induced AA release. DOI (1 μm)-mediated AA release was 51 ± 6%, 61 ± 16%, 63 ± 12%, and 66 ± 9% above basal for vehicle, BAPTA-AM, staurosporine, and BAPTA-AM plus staurosporine, respectively (three experiments). This concentration of BAPTA-AM (30 μm) completely blocked the increase in [Ca2+]i produced by DOI (1 μm) as measured with Fura-2 spectrofluorometry (not shown). Staurosporine treatment, however, enhanced 5-HT2A-mediated IP accumulation, suggesting the existence of a negative feedback loop between PKC and PLC in CHO-FA4 cells as has been reported previously for some cell systems (Rhee and Choi, 1992). Similarly, in CHO-1C19 cells, chelation of [Ca2+]i or inhibition of PKC did not alter 5-HT2C-mediated AA release.1 Taken together, these data suggest that the PLC-IP and PLA2-AA pathways coupled to 5-HT2A and 5-HT2C receptors in CHO-FA4 and CHO-1C19 cells, respectively, are not linked sequentially. Therefore, we considered these cell lines to be suitable systems in which to explore the agonist-directed trafficking hypothesis. CHO-K1 cells also express naturally a 5-HT1Breceptor, the activation of which inhibits adenylyl cyclase and increases [Ca2+]i through a PTX-sensitive Gi/o protein (Berg et al., 1994b; Giles et al., 1996). Activation of Gi/o-coupled receptors has been shown to potentiate stimulated release of AA in a PTX-sensitive manner (Felderet al., 1991). Coactivation of the 5-HT1B receptor in CHO-1C19 cells with the selective agonist CP 93129 (500 nm; EC50 ≈ 20 nm) enhanced DOI (1 μm)-mediated AA release by ∼70% (109 ± 21% above basal versus 182% ± 31% above basal in the presence of CP 93129, three experiments). There was no effect on basal AA release or DOI-mediated IP accumulation. Treatment with PTX (50 ng/ml, 24 hr), which abolishes 5-HT1B receptor-mediated inhibition of adenylyl cyclase activity (Berg et al., 1994b), abolished CP 93129-mediated enhancement of AA release without affecting that of DOI alone. Because some of the 5-HT2A/2C agonists used in this study may also activate 5-HT1B receptors, all studies to determine relative agonist efficacies were done after 24-hr PTX treatment (50 ng/ml) to block receptor-mediated Gi/o activation and possible potentiation of AA release. Western analysis reveals that CHO-K1 cells express Gα11 and Gα13, with low levels of Gα12 and but no detectable Gαq or Gα16. As shown in Fig. 4, we tested the following series of agonists of differing chemical structure and known partial agonist properties in naturally expressed 5-HT2C receptor systems (Glennon, 1990;Sanders-Bush et al., 1988; Burris et al., 1991):d-LSD, DOI, N,N-dimethyl-5-HT (bufotenin), quipazine, and TFMPP. The capacity of these agonists to elicit AA release and IP accumulation was determined simultaneously from the same CHO-1C19 cell population and compared with that of the reference agonist 5-HT. Full concentration-response curves for 5-HT were run along with each tested drug. None of the agonists tested elicited the release of AA or accumulation of IP in parent (nontransfected) CHO cells. Because there was no receptor reserve for 5-HT in either effector pathway (Fig. 2), intrinsic activities (the ratio of the maximal response of a test drug to that of 5-HT) were used as the measure of drug relative efficacy. Results of full concentration-response curves to these agonists are shown in Fig. 4 and Table 2. As expected in the absence of receptor reserve and for drugs acting at the same receptor, the EC50 value for a given agonist was the same for the two responses (see Table 2). However, in contrast to the predictions of traditional receptor theory, the relative efficacies of agonists differed depending on the pathway measured. DOI, for example, was a full agonist with reference to its stimulation of AA release (i.e., its maximal effect was equivalent to that of 5-HT), but only a partial agonist at stimulating IP accumulation. 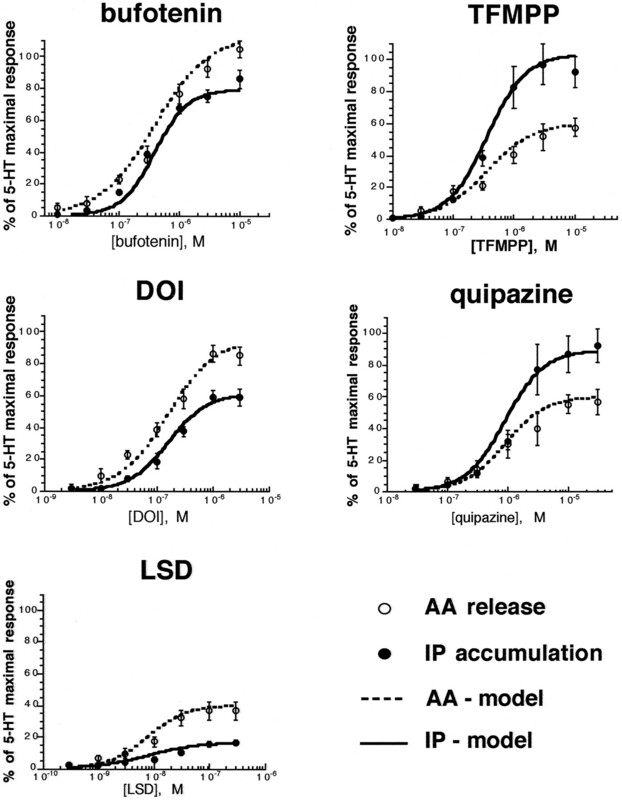 Moreover, relative to 5-HT, some 5-HT2C agonists (e.g., TFMPP, quipazine) preferentially activated the IP pathway, whereas others (e.g., DOI, bufotenin, LSD) favored AA release. Consequently, rank order of agonist relative efficacy was dependent on the response measured. 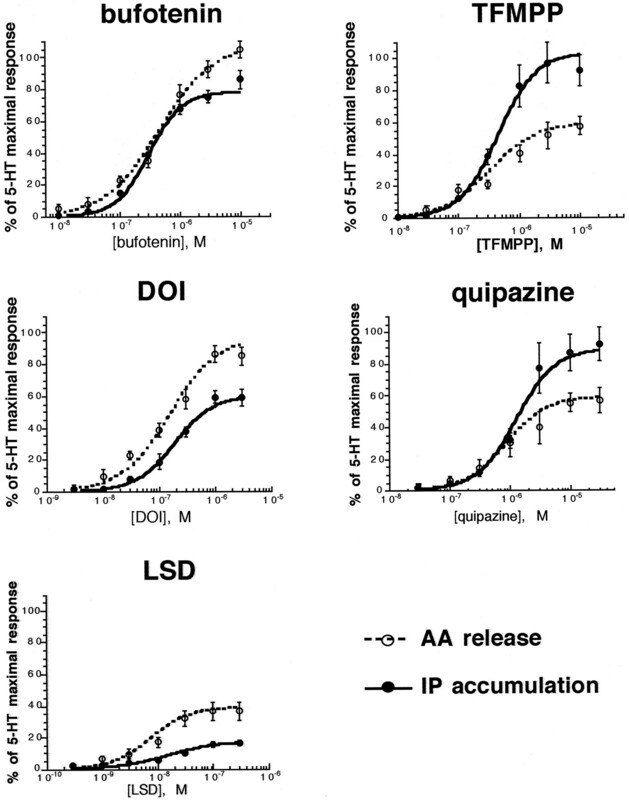 When IP accumulation was measured, rank order of relative efficacy was TFMPP = quipazine > bufotenin > DOI > LSD, whereas when the measure was AA release, rank order of relative efficacy was bufotenin = DOI > quipazine = TFMPP > LSD. These data indicate that the relative efficacy of coupling of the 5-HT2C receptor to the PLC-IP and the PLA2-AA pathways in CHO-1C19 cells is critically dependent on the particular agonist used. Concentration-response curves for 5-HT2C agonists on AA release and IP accumulation after 10-min incubation with indicated agonists. Values represent the mean ± standard error of four to nine experiments.E max, EC50, and slope parameters were determined by fitting individual concentration-response experiments to the equation presented in the text using nonlinear regression analysis. Curves, constructed using the meanE max, EC50, and slope parameters for each agonist as presented in Table 2. 5-HT maximal responses were 171 ± 18% above basal (AA release; nine experiments) and 339 ± 62% above basal (IP accumulation; nine experiments). As we found for the 5-HT2C receptor, the responses to activation of the 5-HT2A receptor by a series of agonists (Fig. 5) clearly were not consistent with classic receptor theory. The finding that tryptamine had a higher E max than 5-HT on AA release but a lower E max on IP accumulation is not explainable if a supramaximal concentration of agonist produces a single stimulus on activation of a given receptor population. Nor is the finding that drugs with similar relative efficacies for release of AA (quipazine, lisuride, DOI,d-LSD) had different relative efficacies in the PLC-IP pathway. These results, however, are consistent with the agonist-directed trafficking hypothesis: the relative efficiency of coupling of the 5-HT2A receptor to the PLA2-AA pathway and the PLC-IP pathway being dependent on the particular agonist activating the receptor. In addition to measuring AA release and IP accumulation, we measured the capacity of 5-HT2A agonists to increase [Ca2+]i by using Fura-2 spectrofluorometry (Fig. 6). In contrast to the differential effects of agonists on two independent responses (AA release and IP accumulation), two responses that are sequentially linked (IP accumulation versus [Ca2+]i), and thus reflect the same receptor stimulus, showed, as expected, no difference in E max ratios (Fig. 5). The capacity of 5-HT2A agonists to increase AA release, IP accumulation, and [Ca2+]i in CHO-FA4 cells.Bars, ratio of the responses to maximal concentrations of the agonists with respect to a maximal concentration of 5-HT (10 μm). Agonist concentrations used were 20× EC50 or K i (Zifa and Fillion, 1992; Almaula et al., 1996) values as follows [(±)-DOI, 1 μm; d-LSD, 0.3 μm; lisuride, 0.3 μm; TFMPP, 20 μm; quipazine, 30 μm; bufotenin, 3 μm; α-me-5-HT, 3 μm; 5-MeOT, 3 μm; tryptamine, 20 μm]. Lisuride and LSD did not elicit a measurable increase in [Ca2+]i. Data represent the mean ± standard error of three to six experiments. ∗, Significant differences between agonist-elicited AA versus IP accumulation (p < 0.05). Changes in [Ca2+]i in response to 5-HT (10 μm), DOI (1 μm), and tryptamine (20 μm) in CHO-FA4 cells. A and C, time course of changes in [Ca2+]i in response to 5-HT2A agonists. Cells were loaded with Fura-2, washed, and exposed to agonist at time 0. Data were collected at 1 Hz using dual-wavelength excitation at 340 and 380 nm and an emission wavelength of 510 nm. Calcium levels were calculated from fluorescence ratios (F340/F380) as described in the text. B and D, agonist-induced changes in peak [Ca2+]i in response to 5-HT2A agonists. Data represent the mean ± standard error of three or four experiments. Numbers in parentheses above the bars, intrinsic activity of the agonists with reference to 5-HT. The mean EC50 value for 5-HT-mediated increases in [Ca2+]i in CHO-FA4 cells was 287 nm (two experiments). These data strongly support the hypothesis that agonists may traffic the receptor stimulus differentially to multiple effector pathways coupled to the same receptor. In classic receptor theory, the efficacy of an agonist relative to that of a reference compound should be equivalent for all responses coupled to that receptor. Use of theE max as the measure of efficacy could introduce errors if one effector pathway had considerable receptor reserve and the other did not. In this case, agonists that differed in efficacy might have almost the same maximal responses for one effector but markedly different maximal responses for the other. This possibility was eliminated in these experiments by ensuring there was no receptor reserve for either effector pathway. Even in the absence of receptor reserve, if the functions relating stimulus to response were significantly different for the two pathways, there might be discrepancies in the numerical ratio ofE max values for two drugs compared with the ratio of their efficacies. Thus, the ratio ofE max values for any two agonists may differ for different responses mediated by the same receptor without invoking agonist directed trafficking. However, with classic theory, as long as the function relating stimulus to response is monotonic, an agonist that has a lower E max compared with any other agonist for one effector pathway must have either the same or lower E max on the other. It is not possible to have a lower E max for one pathway and a higher E max in the other (e.g., compare TFMPP and DOI on the 5-HT2C receptor, Fig. 4; or tryptamine with 5-HT on the 5-HT2A receptor, Fig.5). Another confounding possibility, that the agonists actually have the same relative efficacies in activating the two effector pathways but that the efficacies seem different because of an independent, postreceptor, nonsurmountable inhibition of one of the two pathways, also seems unlikely. Maximal IP accumulation and AA release elicited by 5-HT in the presence of LSD (100 nm; 10× EC50) or TFMPP (3 μm; 10× EC50) in CHO-1C19 cells were not different from those of 5-HT (100 μm; 3000× EC50) in the absence of these drugs. 5-HT-mediated IP accumulation was 150 ± 3% above basal for 5-HT alone and 137 ± 13% and 169 ± 32% above basal in the presence of LSD or TFMPP, respectively (two experiments). 5-HT-mediated AA release was 114 ± 29% above basal for 5-HT alone and 117 ± 1% and 122 ± 2% above basal in the presence of LSD or TFMPP, respectively (two experiments). These data indicate that all of the effects of TFMPP and LSD are mediated by activation of the 5-HT2Creceptor because they can be surmounted by high concentrations of 5-HT. The most likely mechanism by which agonists may differentially direct a receptor stimulus to different effector mechanisms is through differential G protein coupling. Many receptors are known to couple to multiple G proteins (Kenakin, 1996), and Gettys et al. (1994) demonstrated agonist-dependent coupling of the human 5-HT1A receptor expressed in CHO cells to different Gi proteins. The 5-HT2C receptor, when expressed at high density in AV12 cells (Lucaites et al., 1996) and in CHO cells (Berg and Clarke, unpublished observations), has been shown to couple via PTX-sensitive G proteins to inhibit adenylyl cyclase activity in addition to PTX-insensitive PLC and PLA2 activation. Furthermore, in a reconstitution system, the 5-HT2C receptor was found to activate a variety of PTX-sensitive and -insensitive G proteins, including Gq, G11, Goa, and Goa (Quicket al., 1994). Recent experiments show that treatment of CHO-1C19 cells with a 5-HT2C inverse agonist resulted in increased expression of Gα12 and Gα13 ( Berg KA, Stout BD, Cropper JD, Maayani S, and Clarke WP, Novel actions of inverse agonists on 5-HT2C receptor systems, submitted manuscript). Agonist-induced decreases in G protein expression have been interpreted as evidence for receptor coupling (Mullaney et al., 1993;Shah and Milligan, 1994). Consequently, it seems possible that the differential effector pathway activation by 5-HT2A/2C agonists may be mediated by differential G protein coupling. This hypothesis is under investigation. Having demonstrated agonist-directed trafficking, we examined the capacity of the three-state model to account for these findings. Model simulations were performed attempting to fit the experimental data shown in Fig. 4 in which 5-HT2C agonists displayed differential relative efficacy depending on whether the PLC-IP or PLA2-AA pathway was measured. Under such conditions, the three-state model predicts different agonist efficacy orders but identical potency orders (Leff et al., 1997). Evidently, the experimental data obtained accorded qualitatively with these predictions. Furthermore, as indicated by Fig.7 and Table 3, there was excellent quantitative agreement between the data and the model predictions. Although in principle, the agonist-directed trafficking hypothesis allows for a different receptor conformational state (or stimulus) unique to each agonist, this analysis suggests that two active receptor conformations are sufficient to explain pathway-dependent agonist efficacy. According to this model, the basis for differential agonist efficacies is different affinities among different agonists for the two active forms, R* and R** (as exemplified in Table 3). Predictions of the three-state model for 5-HT2C agonists. Data points shown are from Fig. 4. IP accumulation (solid line) and AA release (dotted line) are calculated by substituting parameters shown in Table3 into equations for fR * and fR ** described in the text, with fR * representing AA release and fR ** representing IP accumulation. The assumption was made that fractional responses were proportional to fractional occupancy. It should be noted that the three-state model also can accommodate the data of Spengler et al. (1993) and Robb et al. (1994), who found changes in agonist potency orders depending on the effector pathway measured. The experimental protocols in those studies effectively isolated the two effector pathways from one another. When the model is adapted to account for this, it predicts differences in both efficacy and potency orders between the two pathways (Leffet al., 1997), as observed. There also are several important implications of agonist-directed trafficking for traditional receptor theory and classification. First, as discussed, intrinsic efficacy (ε), as originally defined byFurchgott (1966), is a constant for any particular drug/receptor pair and is independent of the nature of the signaling components coupled to the receptor. If the agonist-directed trafficking hypothesis proves true, traditional receptor theory (which has guided pharmacological research for 30 years) must now be modified such that ε is not a constant and is dependent on the signaling components coupled to a receptor. Indeed, a drug may have multiple ε values. Second, rank order of agonist efficacy, potency, or both is a common pharmacological method for receptor classification (Kenakin, 1997). However, with agonist-directed trafficking, the rank order of agonist efficacy (and potency, inasmuch as potency can be influenced by efficacy) at the same receptor can differ depending on the response measured. As shown in Fig. 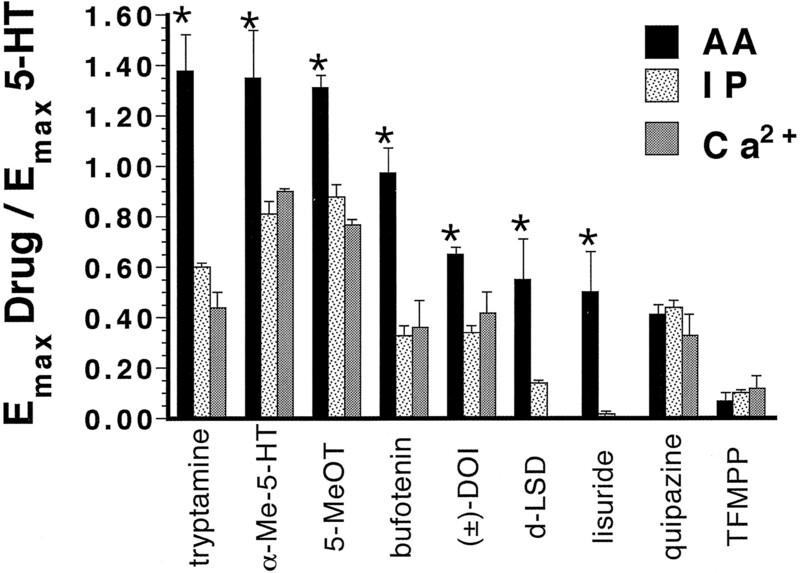 4, rank order of agonist efficacy for the PLC-IP pathway was TFMPP = quipazine > bufotenin > DOI > LSD, whereas for the PLA2-AA pathway, rank was bufotenin = DOI > quipazine = TFMPP > LSD. Traditionally, such behavior would be interpreted as involving different receptors mediating IP accumulation and AA release. If agonist-directed trafficking occurs, then responses that have been characterized as being mediated by different receptors may be in error and require reevaluation. Consequently, classification of receptors based on functional criteria of agonist activity may be prone to error. Agonist-directed trafficking has important implications for both normal and pathological physiological function and for therapeutic drug design. There are several examples of receptors that have more than one endogenous agonist and that couple to multiple effector pathways. For example, the family of P2Y purinoceptors couple to PLC, PLA2, and possibly PLD and are activated by ATP, ADP, AMP, UTP, and UDP (Harden et al., 1995). The opioid receptors (μ, δ, and κ) inhibit adenylyl cyclase, open K+ channels, and close Ca2+channels. Their endogenous agonists include the various enkephalins, endorphins, and dynorphins (Wagner and Chavkin, 1995). If agonist-directed trafficking occurs, the physiological consequence of receptor activation may change depending on which endogenous ligand is seen by a receptor. This could provide an additional means of physiological, as well as pharmacological, regulation. Similarly, in drug design, therapeutic agents could be developed with even greater selectivity than now afforded by exploiting selective affinity for a subclass of receptor. It may be possible to identify or design drugs to preferentially activate pathways coupled to specific receptors that provide beneficial and minimize unwanted effects. We thank Harel Weinstein, Stuart Sealfon, Barbara Ebersole, Alan Frazer, and Jack Peter Green for helpful comments on the manuscript. The expert technical assistance of Jodie Cropper is greatly appreciated. ↵1 The treatment of CHO-1C19 cells with staurosporine did not enhance 5-HT2C-mediated IP accumulation (percent above basal, 314 ± 115 versus 361 ± 110, DOI (1 μm) in the absence and presence of staurosporine (1 μm), respectively, mean ± standard deviation, two experiments). Together with the lack of effect of PLC inhibitors on 5-HT2A-mediated IP accumulation in CHO-FA4 cells, these data suggest that 5-HT2Areceptors in CHO-FA4 cells couple to a PLC with different characteristics (sensitivity to PKC-mediated negative feedback and lack of sensitivity to PLC inhibitors) than the PLC to which 5-HT2C receptors couple in CHO-1C19 cells. This work was supported by United States Public Health Service Grants DA09094 (K.A.B., S.M.) and HD26437 (W.P.C.). Portions of this work have been presented at the International Union of Pharmacology-sponsored Symposium on Serotonin Receptors (1997) and at the annual meetings of the Society for Neuroscience (1995, 1996 and 1997), the British Pharmacological Society (1996), and the American College of Neuropsychopharmacology (1997). (1994) The human thyrotropin receptor activates G proteins Gs and Gq/11. J Biol Chem 269:13733–13735. (1996) Contribution of a helix 5 locus to selectivity of hallucinogenic and nonhallucinogenic ligands for the human 5-hydroxytryptamine2A and 5-hydroxytryptamine2C receptors: direct and indirect effects on ligand affinity mediated by the same locus. Mol Pharmacol 50:34–42. (1986) A G protein couples serotonin and GABAB receptors to the same channels in hippocampus. Science (Washington DC) 234:1261–1265. (1994a) 5-Hydroxytryptamine type 2A receptors regulate cAMP accumulation in a neuronal cell line by protein kinase C-dependent and calcium/calmodulin-dependent mechanisms. Mol Pharmacol 45:826–836. (1994b) Signal transduction differences between 5-hydroxytryptamine type 2A and type 2C receptor systems. Mol Pharmacol 46:477–485. (1996) 5-Hydroxytryptamine2C receptor activation inhibits 5-hydroxytryptamine1B-like receptor function via arachidonic acid metabolism. Mol Pharmacol 50:1017–1023. (1991) (+)Lysergic acid diethylamide, but not its nonhallucinogenic congeners, is a potent serotonin 5HT1C receptor agonist. J Pharmacol Exp Ther 258:891–896. (1992) Drug efficacy at guanine nucleotide-binding regulatory protein-linked receptors: thermodynamic interpretation of negative antagonism and of receptor activity in the absence of ligand. Mol Pharmacol 41:549–560. (1986) Characterization of the 5-hydroxytryptamine 1A receptor-mediated inhibition of forskolin-stimulated adenylate cyclase activity in guinea pig and rat hippocampal membranes. J Pharmacol Exp Ther 238:248–253. (1994) Phosphatidylcholine breakdown and signal transduction. Biochim Biophys Acta 1212:26–42. (1991) A transduction pathway associated with receptors coupled to the inhibitory guanine nucleotide binding protein Gi that amplifies ATP-mediated arachidonic acid release. Proc Natl Acad Sci USA 88:6477–6480. (1966) The use of β-haloalkylamines in the differentiation of receptors and in the determination of dissociation constants of receptor-agonist complexes. in Advances in Drug Research, eds Harper NJ and Simmonds AB (Academic Press, London), pp 21–55. (1995) Fluorescent labeling of purified β2 adrenergic receptor: evidence for ligand-specific conformational changes. J Biol Chem 270:28268–28275. (1994) Selective activation of inhibitory G protein alpha-subunits by partial agonists of the human 5-HT1A receptor. Biochemistry 33:4283–4290. (1996) Characterization of a 5-HT1B receptor on CHO cells: functional responses in the absence of radioligand binding. Br J Pharmacol 117:1119–1126. (1990) Do classical hallucinogens act as 5-HT2 agonists or antagonists? Neuropsychopharmacology 3:509–517. (1996) Diversity and selectivity of receptor-G protein interaction. Annu Rev Pharmacol Toxicol 36:429–459. (1995) P2-purinergic receptors: subtype-associated signaling responses and structure. Annu Rev Pharmacol Toxicol 35:541–579. (1995) Serotonin 5-HT2C receptor stimulates cyclic GMP formation in choroid plexus. J Neurochem 64:199–205. 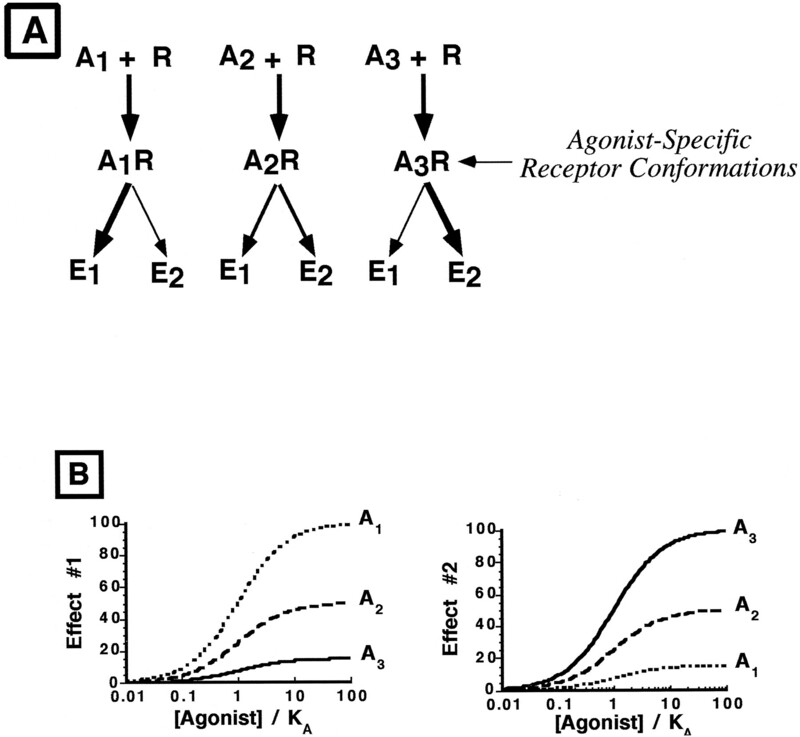 (1995) Agonist-receptor efficacy II: agonist trafficking of receptor signals. Trends Pharmacol Sci 16:232–238. (1996) The classification of seven transmembrane receptors in recombinant expression systems. Pharmacol Rev 48:413–463. (1997) Pharmacologic Analysis of Drug-Receptor Interaction (Lippincott-Raven, New York), 3rd ed. (1997) The stability of the agonist β2-adrenergic receptor-Gs complex: evidence for agonist-specific receptor states. Mol Pharmacol 52:144–154. (1997) A three-state model of agonist action. Trends Pharmacol Sci 18:355–362. (1996) Receptor subtype and density determine the coupling repertoire of the 5-HT2 receptor subfamily. Life Sci 59:1081–1095. (1993) The human muscarinic M1 acetylcholine receptor, when express in CHO cells, activates and downregulates both Gqα and G11α equally and non-selectively. FEBS Lett 324:241–245. (1994) Differential coupling of G protein alpha subunits to seven-helix receptors expressed in Xenopus oocytes. J Biol Chem 269:30164–30172. (1992) Regulation of inositol phospholipid-specific phospholipase C isozymes. J Biol Chem 267:12393–12396. (1994) Agonist-specific coupling of a cloned Drosophila octopamine/tyramine receptor to multiple second messenger systems. EMBO J 13:1325–1330. (1993) A mutation-induced activated state of the β2-adrenergic receptor: extending the ternary complex model. J Biol Chem 268:4625–4636. (1988) Lysergic acid diethylamide and 2,5-dimethoxy-4-methylamphetamine are partial agonists at serotonin receptors linked to phosphoinositide hydrolysis. J Pharmacol Exp Ther 246:924–928. (1994) The gonadotropin-releasing hormone receptor of αT3–1 pituitary cells regulates cellular levels of both the phosphoinositidase C-linked G proteins, Gqα and G11α, equally. Mol Pharmacol 46:1–7. (1993) Differential signal transduction by five splice variants of the PACAP receptor. Nature (Lond) 365:170–175. (1990) Thyrotropin activates both the cAMP and the PIP2 cascade in CHO cells expressing the human cDNA of the TSH receptor. Mol Cell Endocrinol 74:R1–R6. (1995) Neuropharmacology of endogenous opioid peptides. in Psychopharmacology: The Fourth Generation of Progress, eds Bloom FE and Kupfer DJ (Raven Press, New York), pp 519–529. (1993) Signal transduction by a 5-HT2 receptor: a mechanistic hypothesis from molecular dynamics simulations of the three-dimensional model of the receptor complexed to ligands. J Med Chem 36:934–938.